The Marine Corps will make history on Thursday when the first three female infantry Marines join their unit at Camp Lejeune, North Carolina, officials said. The women are headed to 1st Battalion, 8th Marines, where they will serve in the following infantry military occupational specialties: rifleman, machine gunner and mortar Marine, said 1st Lt. John McCombs, a spokesman for II Marine Expeditionary Force. The battalion has a team of women leaders consisting of a logistics officer, motor transport officer and wire chief to support the female infantry Marines, McCombs said. 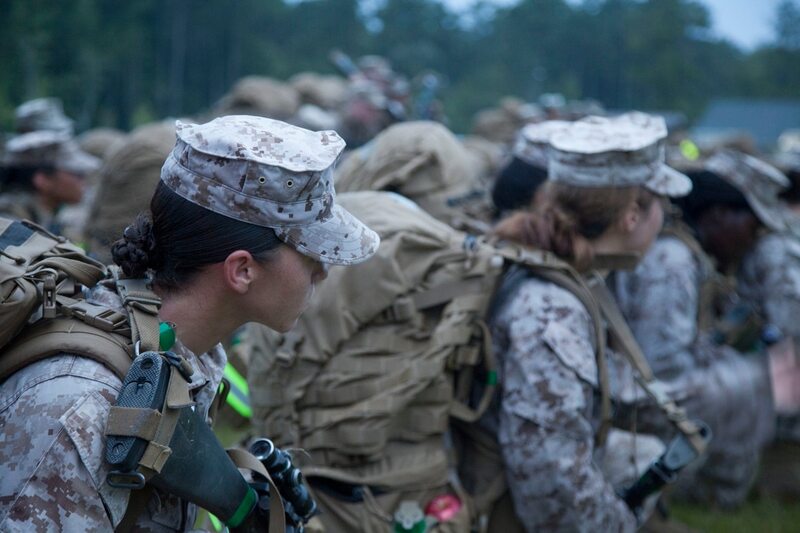 Volunteers in the Ground Combat Element Integrated Task Force train at Camp Lejeune to evaluate various aspects of infantry training, including the role women may play in the future. All three of the infantry Marines graduated from the School of Infantry as part of the service's gender integration research, said Marine Corps spokesman Capt. Philip Kulczewski. "The Corps applauds the time and efforts of those Marines who volunteered," Kulczewski said. "As we continue to move forward, we remain steadfast in our commitment to ensure that the men and women who earn the title 'Marine' will be ready, and will provide America with an elite crisis-response force that is ready to fight and win." In March, Defense Secretary Ashton Carter approved the Marine Corps' plan to allow women to join military occupational specialties that had been restricted to men only. Carter had refused an earlier request by the Corps to keep women out of combat jobs after the service's gender integration study found that mixed-gender teams did not perform as well as all-male teams and that female Marines were more likely to get injured. It is unclear whether President-elect Donald Trump will pursue gender integration in the military with the same vigor as the Obama administration. Retired Marine Gen. James Mattis, Trump's nominee for defense secretary, told Military Times in September that "shortsighted social programs" could make the U.S. military less effective. Marine Corps Commandant Gen. Robert Neller has said no one has talked to him about possibly reconsidering the service's efforts to allow women to serve in combat jobs. "I've heard people speculate on it," Neller told reporters on Dec. 7. "I don't do speculation. Until the 20th of January, we've been told what to do and we're in the process of doing it." Neller bristled when a reporter used the term "women in combat" to describe the military's gender integration effort, explaining that women had been excluded from certain units and jobs, not combat altogether. "With all due respect, I would never insult a female member of the armed service and talk about women in combat," Neller said. "They've been in combat throughout history." For example, Marine spokeswoman Maj. Megan McClung was killed by a roadside bomb in Iraq on Dec. 6, 2006, he said. "I'm coming up on the 10th anniversary when Megan McClung was killed in Ramadi … And I sent her to Ramadi," Neller said. "So, I don't mean to take umbrage, but when people start talking about women in combat, I don't need a class on women in combat."